You are here: Home / Radio / S1E5: When is it Okay to Quit? Anytime you start working towards a big, scary, impossible looking goal, you’re inevitably going to face set backs. Times are going to get hard. You may even get to a point where you aren’t sure if you can do it anymore and you’re going to want to give up. Throw in the towel. Stop the frustration and the pain. Sometimes, that’s exactly what you need to do. It IS time to close up shop and move on with the lessons you’ve learned from the school of hard knocks. Many times though, it’s not that time. It IS time to push a little harder, give it a “real” go, and see what is really possible. So how do you know what time is what? When do you muscle through and when you let things end? 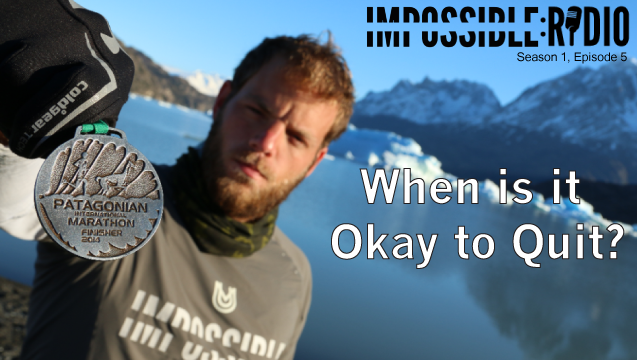 We break it all down in this episode of Impossible Radio: Resilience. This was another great episode in this series. I really enjoyed your emphasis how you broke down the process of first being selective, then “having a solid ‘why'” about your choice(s), and finally to understand the trade-offs needed to achieve the outcome. Right now I’m in the middle of a huge undertaking in my life. I gave a great deal of serious thought before beginning the project, but HOO BOY have I had to come back to my solid “why” A LOT these past few weeks. Revisiting this “why” has made it so much easier when my little comfort-seeking voice starts reminding me of the “fun” I’m having to give up. However, my “why” says it’s going to be worth it, and is helping me to write a story worth telling.